The cryptocurrency market has seen a slight rebound over the past 24 hours after Bitcoin managed to break back above the $5,000 level, once again. This rebound has helped the majority of the top 20 cryptocurrencies climb slightly higher. 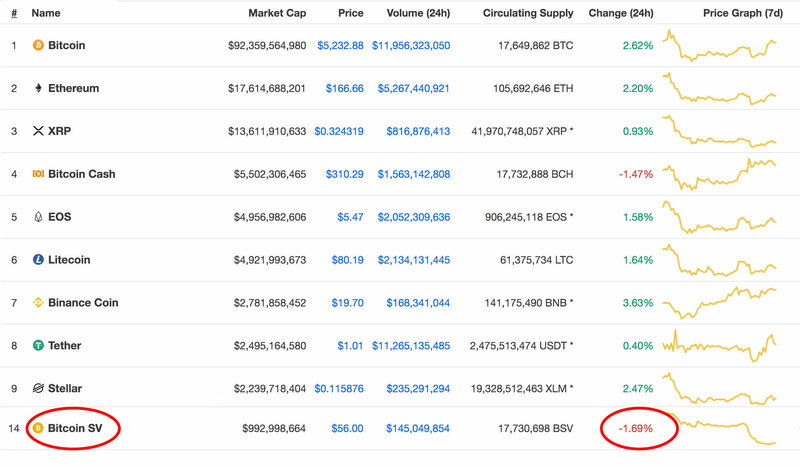 However, after the recent controversy, Bitcoin SV continues to tank further lower. From above, we can see that in today’s trading session, Binance Coin is leading the way with a 3.63% price hike, bringing the cryptocurrency for the largest crypto exchange close to the elusive $20.00 handle. Stellar, Ethereum, and Bitcoin have all had price increases that are over 2%. Bitcoin has returned back above $5,200 as the market now attempts to break above strong resistance at the $5,250 level. Above this, the next level of significant resistance is at $5,455. Bitcoin is still up by a total of 43% over the previous 90 trading days.